Oaktown artist Zachary Sweet showcases his “Hear Me Spirit” Collection at Woot Bear. It’s a mix of weirdos, monsters and ghosts from his dreams, nightmares and his artsy brain. The “Hear Me Spirit” Collection features new paintings, mixed media pieces and resin figures. If you like dark humor, then check this art at Woot Bear. During the 1950s and thru 1960s, all across America with robust car market, the movie drive-in theater was also at the height of it’s popularity. Artist Andrew Valko’s series of drive-in theater paintings gives us a taste of Americana and through the “eyes” of the drive-in movie customer. If you’re in Taipei this August through September, stop by artist Martin Hsu’s exhibition “In Dreams” at the Wrong Gallery. “In Dreams” is Martin Hsu’s take on “Little Red Riding Hood” and bowl of noodles. The “In Dreams” exhibition runs from August 9th thru September 2nd, 2014. If you read lots of science-fiction books from authors like Isaac Asimov, Arthur C. Clarke, Ben Nova, Orson Scott Card and John Scalzi, there is usually a beautifully painted cover book art of the galaxy, outer space world or spaceship and that artist is John Harris. The Art of John Harris: Beyond The Horizon is a collection of his many works since the 1970s. 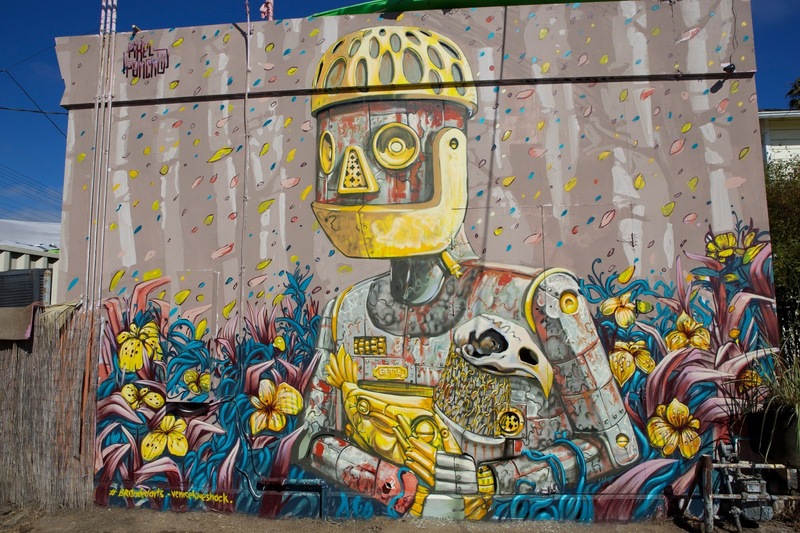 Art about robots is art about our future culture as artist, Pixel Pancho, conveys humanity emotionally interconnected and intermixed with androids and pop icons. As with any art like the classics of Michelangelo and Leonardo da Vinci to Mexican mural artists such as Diego Rivera and David Alfaro Siqueiros, we can see the glorification of humanity in all its elements of beauty, love, chaos, destruction and yes, even the propaganda – that art leaves you to think and feel your own thoughts of what is the meaning of this? Awhile back Amazon created a cool Retro Video Game Shop and Amazon.com has been expanding their reach and now they will also sell collectible fine art and modern contemporary art. Shanghai-based artist Yang Yongliang melds downtown city buildings into mountains and natural landscape. The Moonlight – the landscape without night by Yang Yongliang. Alice in Wonderland 1 (Part 1) by Yang Yongliang. Viridescence no. 1 by Yang Yongliang. For more of Yang’s landscape art, photography, gallery exhibitions and updates, go to: Yang Yongliang. Ever wonder what your cartoon Disney princesses would like in the real world? Would they look like a Barbie doll or a Valley girl? A college kid from the UK – Jirka Väätäinen did his own Photoshop project and rendered various Disney heroines with real world female faces. I like technology and I enjoy collecting toys, but what I like more is art that says something to our hearts and minds. My friend Johnny Moreno creates these incredible paintings on canvas celebrating the rich Latino history and culture. And with Wondercon approaching this month, we should try to hit up Artist Alley and support our indie artists.